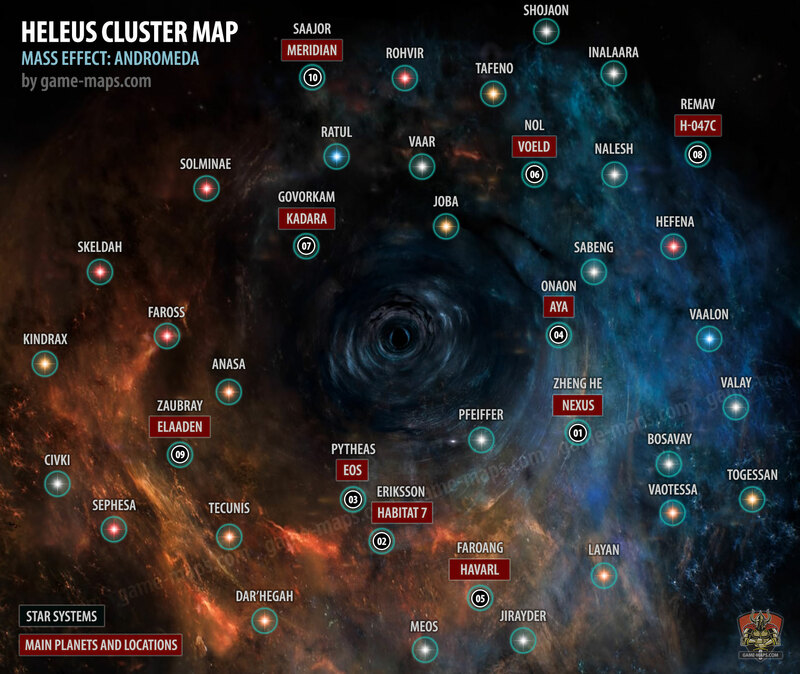 Heleus Cluster Map - Mass Effect Andromeda. Star Systems in Heleus Cluster for Mass Effect Andromeda. Maps, Walkthrough & Game Guide. Anasa, Bosavay, Civki, Dar'Hegah, Eriksson, Faroang, Faross, Govorkam, Hefena, Jirayder, Joba, Kindrax, Layan, Meos, Nalesh, Nol, Onaon, Pfeiffer, Pytheas, Ratul, Remav, Rohvir, Saajor, Sabeng, Sephesa, Shojaon, Skeldah, Solminae, Tafeno, Tecunis, Togessan, Vaalon, Vaar, Valay, Vaotessa, Zaubray, Zheng He. Anomaly Starship Wreckage + supplies.